Newsletter Campaigns for Subscribers and Groups. Groups Newsletters helps you to communicate efficiently, providing targeted information to groups of recipients through automated campaigns. Purchase a license and download the plugin. Unlike your average newsletter system, Groups Newsletters combines multiple stories in a newsletter and uses campaigns to send out one or more newsletters to their recipients. The recipients for each newsletter can be different user groups (when Groups is also used). 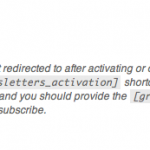 You want to send specific newsletters to a subset of the site’s users. For example. if you have a Premium group to which users who have purchased premium access to the site belong and you want to send out a newsletter offering them a special discount. You maintain groups for specific products or services and want to make their users aware of a new feature or bug fix without sending the same information to normal subscribers. Communicating with departments in a company – send out specific news that is relevant for those working in one department. CRM – target valuable information at customer groups. 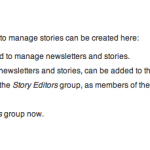 To quickly create a Story Editors group for users who should be allowed to handle newsletters. Let customers subscribe to newsletters at checkout with the WooCommerce Groups Newsletters add-on. For regular subscribers, you can work without Groups and take advantage of the powerful newsletter campaign management features provided. Please refer to the documentation pages for more information. Groups Newsletters provides lots of sensible WordPress actions and filters that you can use to customize the system. It leverages custom post types and taxonomies to provide a system that any developer who is familiar with those concepts in WordPress can use, to provide a customized solution for your client. If you have questions or suggestions, feel free to post a comment on the Groups Newsletters plugin page. Hi again Kento, I followed your directions on this page (http://docs.itthinx.com/document/groups-newsletters/starting-a-newsletter-campaign/) and the last step “Click Publish and then under Status click Run to start the campaign.” … All I see is “pending”. It turns out that I had to go back to editing the campaign and click “Run” there. Well, now it has been 40 minutes since I clicked “run” and no emails have arrived. Also, I did not see how to put more than one story in a newsletter. Actually, I don’t see anyway to put a story in a news letter. Can you help me? If the campaign does not advance at all in processing the queue, then it can be likely due to a) little or no traffic on your site b) CRON not working. Please have a look at the Troubleshooting section for details. 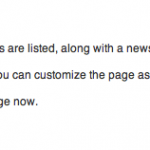 To add a story to a newsletter, you can simply select the newsletter in the Newsletters box while you edit the story. See Stories for a more detailed description please. Hi Guys, I just purchased the “Newsletter” addon from evanto. I have installed it and the mail feature is working. However, I am surprised by the fact that I can not email a generic blog post. Is there any way to tweak something that would make this possible? Hi Eric, also following up on this one – the system is designed to use its own Stories post type specifically, normal posts are not mixed up with those – the advantages and motivations behind this design decision are explain there, too. If you would like a normal post to appear in a story, you can simply link to it and provide an excerpt so that readers are motivated to visit the blog post. You should be able to use shortcodes in general, so any plugin that provides a shortcode to render information about the user should do. I’m not really sure about the specific dates, unless you could just add them in the text literally, you would probably need to write your own shortcode that would pull in the desired date. I manage a Mandarin language school. Our classes are quarterly and the students are currently assigned to itthinx groups when the sign up for a class. I want to be able to send emails to specific groups/classes, and I would like to have them personalized with the first name. I am thinking each quarter is a campaign, and each class has a group of stories. Would it be possible to create a group of newsletters for each course and assign a send-date to each newsletter? Yes that sounds like a match – I would recommend to have a look at the details from the documentation. You can schedule a campaign for a certain date instead of publishing it directly, too. Hi Kento, it has taken me a while to start working on this but I have purchased your “groups newsletters”, and I have verified that it is installed properly. However I not clear how to do what I want to do. May I explain? We offer several 10 week courses every quarter of the year, that meet once a week. In order to keep the students focused I want to send them emails once or twice a week. I plan to setup CRON to trigger the emails every morning at 1AM. Cron will call my nightly email procedure that will determine which classes need emails and send them out. Is this possible? I have poking around in your documentation and I haven’t found any clues. I would really like to have this setup by New Years. Thanks! Thanks for explaining what you try to do – I think that the tool can actually make it easier for you to handle as it automates the process of sending those emails out up to a certain extent. You wouldn’t need to set up a particular cron job as it handles that by itself. If you haven’t already seen it, I would recommend to have a look at the section Starting a Newsletter Campaign to get an understanding of the process – besides publishing a campaign ‘right now’ you can also schedule it, which would fulfill your requirement of scheduling the moment at which the emails are sent out. The system will then send those out gradually based on the parameters used, it is advisable to use a dedicated email account and enable the SMTP settings, also adjust the batch settings to assure the parameters are within those allowed by the email provider – you will find details on these on the Settings page. Just bought your plugin…. but story gives an error 404. And also when I hit the subscribe button the subscriber is not shown in the wp-admin section. Please try to recreate the permalinks visiting the Settings->Permalinks section and save the page, you don’t need to change anything. Plain subscribers are those who do not have a user account on the site. Please have a look at the documentation page. If a wordpress user subscribes, you can see it from the WordPress Users section. I am wondering how I can make it so new users are automatically subscribed? I use SSO on my website so users don’t actually see any sign up form where they’d be able to ‘opt in’ for newsletters and we would rather have them all subscribed automatically and not have to go in the Users part of WP to add them there. Perhaps there is an API call I can use in my SSO code to automatically set their Subscribed status to YES? Do you plan on providing support for GMAIL SMTP? 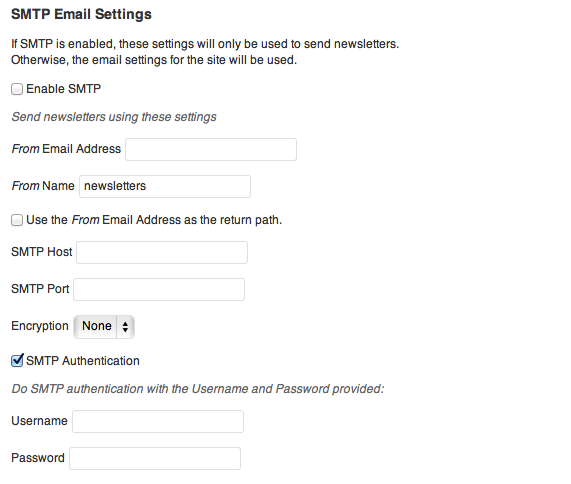 From Newsletters->Settings you can set your SMTP settings. Maybe this post can help you to setup your gmail account. The plugin doesn’t have the option to add the google’s api credentials. As far as I know, using the google smtp configuration should work. From Codecanyon you can request a refund, although I hope you can use the google settings. 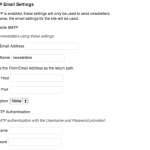 Enabling the SMTP option you can configure the email’s settings. If you use the ‘normal’ system, it is based on the wordpress email system, this is beacause the email subject is WordPress. However, I don’t understand one behaviour: when a plain subscriber (not a user) unsubscribes, it is completely removed from the subscriber table. Why not simply setting its status as “inactive” instead? It would prevent us from wrongly re-subscribe it in a further import, for example, which would be safer. So what is the purpose of the status field in the subscriber table? The status field is used to keep track of subscribers pending activation. The subscribers are completely removed right now based on the assumption that their data won’t be needed anymore as they have opted out of subscriptions. But I can see the case where you’d want to keep track of those cases as well, even just for stats. It might be useful to change this as you suggest. One question, how do you work with the imports? Do you frequently export and import the subscribers? I’d like to understand which process you use to see if we can improve this. 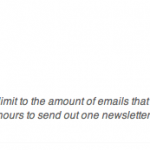 – That I create as many groups as desired newsletters. – That I code a page where users are proposed to subscribe to the newsletters they are not yet subscribed (which means under the hood: add them to the corresponding groups), and to unsubscribe from the newsletters they are yet subscribed (which means under the hood: remove them from the corresponding groups). Is that it? Is there anything else I should consider to make it working? Bonus question: if you consider providing this feature yourself as an option, when do you reasonably imagine to release it? This is important for me to know since it would not be a trivial thing to code the above feature, and maybe I could survive with only one newsletter for a while. Thanks anyway for your support and for the great plugins you deliver! Regarding a possible enhancement, it would not be before early next year to be honest as we’re fully scheduled already. Does the above help? Thanks Kento for the tips. Will try this and get back to you if necessary! OK, it’s a pity that I got no answer to my questions, but don’t mind, I have sorted this out alone. However, I have a TRULY IMPORTANT question: how could I manage, possibly by developing some php code, to provide my users a way to subscribe/unsubscribe selectively to certain newsletters, not to all at once? Truly sorry for the delay, I’m answering to this one first. Currently it’s not possible to subscribe to only one based on a group for example, but it’s worth considering to add this as an option to the plugin. Another way would be to allow them to selectively join a specific group and then they would only get the related newsletter if they are members of the group. Would that work for you meanwhile? I’m trying to use the plugin to send a single newsletter, and I’m not able to make it working correctly. Actually, I’m confused with the various terms you use in various parts of your plugin and documentation, such as “subscribers”, “normal subscribers”, “plain suscribers” and registered members and groups members. 1/ All site registered users who have the quality of “subscribers” in the corresponding column of the list of users in the WP backend. 2/ Additionally, to all “subscribers” who are not registered on the site but who have subscribed through the Groups newsletter “subscribe” button, on the Newsletter subscription page. They are appearing in the “Subscribers” sub-page of the Groups Newsletter plugin settings page. So why I’m doing is to check the “Newsletter subscribers” checkbox in the Newsletter edit page and don’t select any Groups below. But it only send to the subscribers who are not registered users (second item above). What am I doing wrong and how to achieve this? Thanks for your quick response, I do have to send this newsletter ASAP! #1 You would direct the newsletter at the Registered group so that anyone who has subscribed and has a user account receives it. I’m trying to use the stories “order” field to make them appear in the desired order within the newsletter. I’m assigning the order “5” to the story I want first a “4” to the story I want second. However, they appear in the wrong order. Furthermore, if I switch their order number (“4” for the former and “5” for the latter), it doesn’t change anything. However, the stories are published in the reverse chronological order: the last published is always the first in the newsletter. Is this the desired behavior? Am I wrong with the usage of the “order” field? There seems to be a problem with it. We are working on an update to solve it. Great, thanks for the response. Looking forward to get the fix. In the meantime, the workaround is to adapt the publishing dates of the stories accordingly. Not so nice but working. Thanks, not sure how it happened because it worked initially, but now the members in the test group (my own login and a test user) didn’t have the “Subscribe to our newsletters” checked. So fixing that made it wok again. Hi, I have a problem with that no mails gets sent when I run a campaign. I’ve made my Story, added it to a Newsletter with a “Groups-group” (just a test group with my own user for now), and added it to a Campaign. I’ve run som test Campaigns to see how my mail template behaves, and first the mail arrived fine, but now no mail get sent when I run a Campaign. When I go to the Campaign list it says this for my Campaign: “running (queued) 0 / 0”. That looks like it doesn’t think it should be sent to anyone? If I update the Campaign page or list after a while it says the Campaign is “executed”, but I still haven’t received any mail. This is because there are no recipients for the Newsletter. Please make sure that you add subscribers or groups to the newsletter that is to be sent out with the campaign and if you choose a group, the group should have at least one member. I would recommend you create a Test group with a couple of test users who belong to that group and related to emails you have access to. Then create a simple story and assign it to a test newsletter. Create a campaign for that newsletter and run it. With two recipients, you should will then see “running … 0/2” in the campaign etc. I thought I were quite clear, but apparently not. 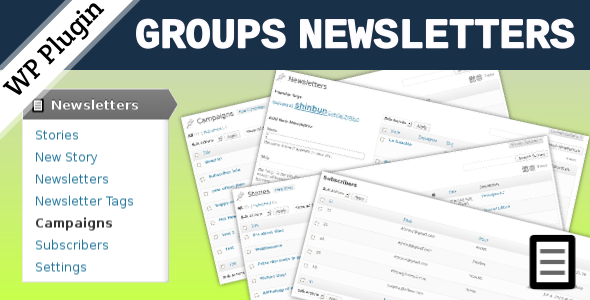 The newsletter has an assigned group (a test group) from the Groups plugin. And initially it worked but stopped working all of a sudden. Yes there is a group, but there are no recipients in the group. If there are members in the group, then none of them is subscribed to the newsletter. You can check that on the Users page under the Subscriber column, too. Hi – I am using Groups on a new client site where we have about 17 different choirs, each corresponding to a group. Each choir (group) has a private page where posts to that choir only will appear. I have categories set up in posts to correspond to each choir also. I need to be able to send an email to a group if a news item is posted to their specific blog category, telling them to go check out their page on the site. Would Groups Newsletters be able to help me in any way? – Create a newsletter per group. 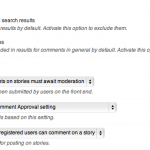 – When you publish a new post, then create a new Story with a summary and a link to the post. – Assign this Story to the newsletters. 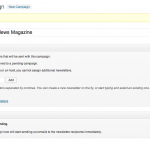 – And create a Campaign to send these newsletters. You can see more information in the documentation page. Is there any way to customize the placement and text for the newsletter opt-in checkbox on the registration form? I’m in the process of switching to Groups Newsletters from another newsletter plugin to be able to send mail to specific groups from the Groups-plugin that I’m using on a membership site. When the users register there’s some fields they have to fill out and I’d like to have the newsletter opt-in grouped with those fields, not between the captcha and the submit-button at the end. And I also need to change the “Subscribe to our newsletters”-text since the site isn’t in English. In the documentation it says there’s an API but I can’t seem to find any information about it anywhere. Also, Is there any way to bulk-edit users so that the existing users get the “Subscribe to our newsletters”-checkbox checked? I’d rather not have to do it manually on hundreds of users. The order of the field depends of the plugin that you are using, please let me know the plugin name, so I can try this. Relating to the translation, in wp-content/plugins/groups-newsletters/languages you have a .pot file that you can use to create your own translation. From Newsletters->Settings, you can export the existing users list, to import this later (make a full backup before to do it). There’s no plugin for the fields (except for the Captcha), it’s just custom user meta data fields displayed on a page template for user registration. The issue is where the “Subscribe to our newsletter” checkbox and text is placed. When I check the “Show on registration form” checkbox in the settings page, it’s automatically added before the submit button (and after the captcha), but I want to place it further up with the other fields the user have to fill out. Is there any way to control the placement of it? Ok I guess I could do a “incorrect” translation of the phrase then so it says what I want. the plugin uses the ‘register_form’ hook, maybe playing with this you can set the field in the correct place. I’d prefer not to override your code with my own hooks since it could break if you change your code. I were hoping there would be a bit more settings in the plugin for these kind of things. The option to place the opt-in-checkbox wherever you want on a registration page. Maybe with a shortcode? thanks for the suggestions, we will consider. Another question – How are updates handled to the plugin? I purchased it from Envato – how will I know when it is updated? 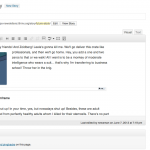 Just a comment – I think you would be best served writing a plugin that interfaces groups to all of the email tools already out there which are much more full featured. Mailpoet, MyMail, Mailchimp, etc. usually when a new Envato plugin is updated, an email is sent. Relating to the emails system, thanks for the suggestion. Login to submit for newsletter? Why should the user be logged in? Where can i find this in the settings? maybe you are using an existing email, please have a look at the ‘force_user_login’ attribute of the [groups_newsletters_subscribe] shortcode. I’m having a bunch of issues with this plugin. Spent the better part of the day trying to understand how it works. – Two copies of each newsletter is sent to each subscriber. I’m not using SMTP, and have WP-Mandrill plugin installed. This is the biggest problem. Newsletters are being sent to only one group (a test group) and there are a total of 3 emails there. Same thing happens if I disable WP-Mandrill. 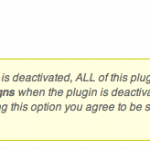 – I use a plugin (Profile Builder Pro) so users do not have exposure to WordPress registration. There is no way for users to register themselves as part of the on boarding process. It appears checking the boxes to auto-register don’t work with Profile Builder. I have to create a page where they opt in via shortcode. This is not desirable. – Took me a while to figure out how to subscribe existing users. There is an import function in settings and a checkbox to import all of them – it doesn’t appear to work. I disabled the Profile Builder Plugin and it still did not work. – The user listing remains blank on the “subscribers” page even if a user clicks “subscribe” – though they are now a subscriber if I download a .csv. Is the “subscriber” listing for the plugin only for non-registered users? I assume it is – it took me a while to figure that out. – Users can be manually subscribed via the Admin “Users” interface; this is not documented. Subscribed users do see an unsubscribe button and it works, but the “You are subscribed to our newsletters” does not appear, only “Opt In”. 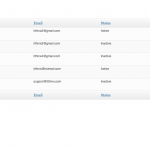 – Probably there is another plugin that duplicate the email. If you send the ‘test email’ from Newsletter->Settings, do you receive the duplicated email? – Sorry there isn’t an integration with Profile Builder Pro. You could try to create a checkbox registration field with id and name ‘groups_newsletters_subscriber’. Sorry, I can not test this because I haven’t this plugin. – Related to the import function, maybe there is any problem with the file imported. You can try to import with a simplest file (with one or two users). Please have a look at the documentation page. – The Subscribers section display plain subscribers are those who do not have a user account on the site. – That’s true. We will review the documentation, thanks. – The correct attribute is ‘user_confirm_message’. – I found the user meta field with “groups_newsletter_subscriber”. Thank you. I can probably manage from profile builder, which would be good. 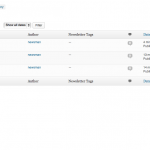 – I am not trying to import a file, only import users that are in the existing wordpress database. There is a checkbox that gives this option, but it cannot work. I suppose a workaround is to export all wordpress users and re-import via your plugin. – Sending a test email works fine. Only when I send to users in a list is it doubled up. I’ll see if I can debug further. – That’s true, We are working on the ‘subscriber_message’ to fix an issue in the next update. – Yes, ‘Subscribe existing user accounts’ applies when importing a file. So you need to export the users and import them. The conflict was being caused by W3 total cache. Once I disabled it the system worked fine. Many thanks for letting us know. That shouldn’t happen though, maybe there was a specific setting in W3TC that interfered? I have emailed screenshots etc to the support address without reply. I did get a reply to a comment posted here and the reply I received seems to be gone ? I’ve tried removing the plugin and rebuilding but the initial testing seems very odd,. a test email sent just has the name and unsubscribe link and nothing else ? We have this website using various groups (NLONLY, UKONLY, FRONLY). We try to make it happen that if we publish a post “UKONLY” that the users in that (UKONLY) group get an notification-email with the title, an excerpt and a link or read-more button. How do we get this working? Hope you can help, really dont know how to fix this. You can do this with campaigns directed at every specific group except that it won’t send out the notifications automatically but rather through the campaigns. Please see Starting a Newsletter Campaign for instructions on how to create a campaign. In your case, you would create a separate newsletter for each group and then send it out using one campaign for each newsletter. I got the same issue as PBR that having 404 page not found when clicking the view link from story. I have copied the template folder and its content from newsletters plugin into our custom theme’s root directory and named as “groups-newsletters” or “template”, but no success! Do I need to modify the coding in the php files? please have a look at this. If the problem persists, please let me know. I have read the sample in that link already and I found that the content (e.g. single-story.php) is different among in each themes, that’s why I am asking do I have to modify for my custom theme as well. Is it possible to use the original template in the plugin folder directly? sorry I don’t know why I am not able to see “Your comment is awaiting moderation” sometime so my comment may be duplicated as I do not know does it sent successfully. you should see your comment with a ‘Your comment is awaiting moderation.’ message. you can use the plugin templates files (single-story.php and taxonomy-newsletter.php) in your theme, creating a ‘groups-newsletters’ folder and copying the files in this new folder. The problem is I have copied the plugin templates files (single-story.php and taxonomy-newsletter.php) under my theme but I still got the 404 page not found. I do not need any customize for my theme at the moment but I have to fix the 404 error first. The problem is the message ‘Your comment is awaiting moderation.’ didn’t appear some of the time. If you don’t need customize the templates, you should not have to do anything. If you send me dashboard admin access to antonio at itthinx dot com indicating this conversation, I’ll have a look at your settings. please send me dashboard admin access to antonio at itthinx dot com and I’ll have a look at your settings. I am quite sure the email address is correct! Is there any way to get contact with you? Can you send me an email for me to reply to? I purchased the Group Newsletter plugin via codecanyon.net, so I do not have a login for the itthinx.com and cannot seem to create an account to post a question to the forum support message board. 1) Is there a date/timestamp field associated with a newsletter when it is created? 2) How would a person go about writing a query to retrieve data from a newsletter? For example: get an array of the three most recent newsletters might be something like this?? 3) I am working on a custom theme, and while in the wordpress cms and editing a story or newsletter, the ‘view’ link directs me to a 404 page. Is there a particular php file needed to display newsletters and/or stories? 1.- ‘newsletter’ is a custom taxonomie. WordPress doesn’t store this data when the taxonomies are created.If it’s crucial to what you’re doing, you would need to hook into the taxonomy creation process somehow and manage such data yourself. 2, 3.- Please have a look at get_terms and the templates documentation. Antonio – thanks for the quick response! 1) How can I create an account with http://www.itthinx.com/submit-a-topic/ ? I purchased the Group Newsletter plugin via CodeCanyon.net so I don’t have an account in order to access the support forums. 2) How can I turn on the featured image capability in WordPress for each story in Group Newsletter? I have already added the function.php file the add_theme_support( ‘post-thumbnails’ ), not clear what is needed to get the Stories to have that capability. 1.- That’s true. Don’t worry, You can continue using this comments system. 2.- ‘Story’ is defined in groups-newsletters/lib/ext/class-groups-newsletters-story-post-type.php, and ‘supports’ array param doesn’t include ‘thumbnail’. Remember that modify code is not a good idea. Im considering to buy your newsletter solution, but I wanna be sure: we have currently app. 8.500 subscribers in our mail list. Is it a problem for Groups Newsletters to mail this amount? I’ve updated the newsletters plugin and I had it set up for SMTP mailing, but now it appears to have vanished from the admin section! Where could it possibly be? If I go to plugins, I can click on settings, and the settings are there, but there is no menu item at all now. If you don’t have this menu, please try to re-download the plugin and reinstall it (maybe there is any file corrupted). Did you get any errors in debug.log? Then visit your dashboard page. If errors exist then a file named debug.log under wp-content folder will be created. The log entries refer mainly to sharebox issues. Nothing I can see about newsletters. If you want I can post it here, or would you prefer I sent it separately or do nothing with it? Please send me the file to antonio at itthinx dot com. If you send me dashboard admin access, I’ll have a look at your settings. I’ve used the crontrol tool and it all seems to be well. But still no emails being sent apart from single tests ? If cron works fine, maybe the test emails have ended up in the spam/junk folder? Can you please provide admin credentials to your site so I can have a look and test? Please send these to support at itthinx dot com. With crontrol not reporting any issues any ideas why emails should be queued and not sent ? What is the current version of the plugin and are there any known conflicts with other plugins ? If cron is working then the only reason that I can think of is that the campaign is not running or has been paused. See http://docs.itthinx.com/document/groups-newsletters/troubleshooting/ for known problems please. The current version is 1.3.1. I am using Q-translate X as a multi language and I get a display problem with the title of the newsletter. It displays the language tag in the title itself. Could you tell me what and where to correct that in the code ? Is Q-translate X compatible with custom post types? Based on what you explain, it seems that it doesn’t recognize the parts that it should translate. Have you asked the plugin author if they can give any clues why it doesn’t work? I’m not familiar with that plugin myself, but the code that you use seems correct. How would I fault find this plugin ? A single test works fine but emails are being sent when a campaign is executed. I’ve checked the server error lock without seeing anything suggestive ? And no emails are sent – please advise. This is because the mbstring PHP module is not enabled on your server. Can you enable it? Otherwise we’ll need to issue an update so that the use of that function is avoided when this module is not enabled. I am looking for a way to integrate mailing new posts to the users subscribed to those areas. Will this plugin automatically mail new posts to members in groups that have access to them. Example, I have 10 members subscribed to the “Cars” group who can visit the site and have permission to view posts in the “Cars” category. When a new post is published in “Cars”, can it be emailed to them? 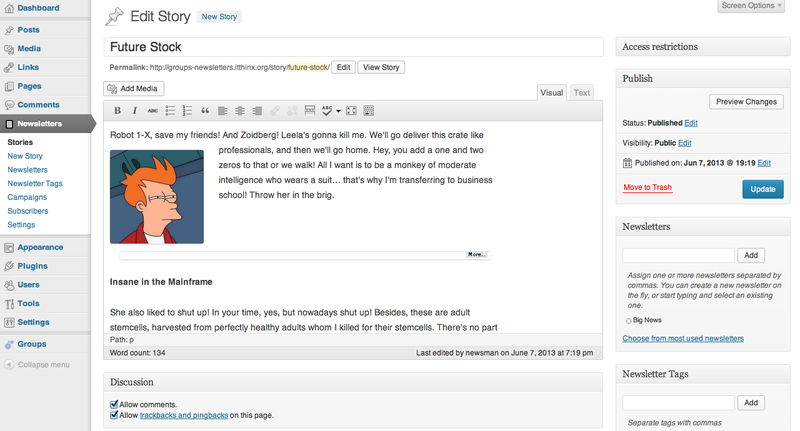 What I would really like is a way to integrate groups with Mailpoet or Mailchimp. Any FAQ’s there? This won’t be suitable in this case because it isn’t intended to notify users of new posts automatically. If you’d like to see details on what it does, please have a look at the documentation here – it works with a dedicated post type Stories (maybe at some point we could consider creating period newsletters automatically but right now this isn’t supported). Integrating Groups with MailChimp is certainly a good idea 🙂 What would you like to see in terms of functionality? I think it would be good if there was a way to link capabilities of each user (based on groups membership) with custom fields in Mailchimp or Aweber. This way custom lists could be built based on the presence or absence of those capabilities. I can then use RSS feeds to drive new mailings – except the RSS feeds must be obfuscated from the general public. Not pretty. If I have a user who is part of the Alpha group, and Alpha has the capability “topsecret”, is this capability a general wordpress custom capability I can view with plugins such as user role editor? It doesn’t appear to me that this is the case. Thanks for sharing your ideas on integrating with MailChimp – I think it would be more suitable and intuitive to have groups mapped directly. Also you might want to have a look at Groups2MailChimp. Regarding your question on capabilities, these are specific to Groups and you won’t find them unless the other plugin is properly integrated with Groups. Hi, I’ve been using Groups2MailChimp for over a year and it was great. It seems to have been discontinued and also it isn’t working anymore. Any ideas on how I can sync my Groups with MC groups? We’ve just released Affiliates MailChimp and the integration with Groups would be worth looking into. But I can’t promise on any particular ETA for this yet though due to other commitments in our schedule. If it’s urgent, please get in touch via support at itthinx dot com to discuss a possible sponsored release. I wrote to support to see if there’s a solution. Do you think I can get a programmer to hack the Groups2Mailchimp plugin so it will work with MC API v3? Many thanks for that, I’ll review it and follow up – yes, you can also try to adjust the plugin. You could use Groups Import Export to export the users and import them into MailChimp in bulk periodically. You can see details on exporting with this tool on Export Users – it’s an alternative while we work out an up-to-date integration between Groups and MailChimp’s latest API. Ok so if I use Groups and Groups newsletter, and I add the Groups restricts categories, I could display sidebar link to the newsletters on the website according to who is logged in ? If I sent newsletter 1 to group A and newsletter 2 to group B, when a member of group A is logged in he could only see the newsletter A ? Even if a story of newsletter 1 is also figured on newsletter 2 ? Another idea, you could also create a custom widget using Custom Post Widget and use the Groups shortcodes to display content conditionally. And the other option would be to have them displayed automatically using the restricted newsletter taxonomies for which you can use Groups Restrict Categories. I am coming back to you with your suggestion of using the Custom Post Widget. I don’t see how I could display the newsletter sent to a group of the logged in user. Only members of the Gold group can see this. where can I find the code to display the newsletters ? I would recommend to set up separate newsletters for each group, this is easier to maintain and much less complicated than trying to craft a single one which attends to all groups. Members of the Gold group would only be able to see content restricted to their group, you can do that using the normal access restrictions on the Stories that comprise a newsletter. Newsletters and stories are accessible directly via their URL, but you can also use the Shortcodes (link points to documentation page). I hope that clarifies and helps, please let me know if you need further indications with that. Thank you for your answer Kento, I see what you mean… at first I thought I could use the group restrictions but the problem is that I wanted to use the stories system to be able to allow some groups to see a story and some not… for example. Newsletter Silver to Silver group. Now what will the Gold user see on his newsletter listing page ? won’t he see both newsletters as in the Silver one, there is story 1 which he is allowed to see ? and what will he see ? the complete newsletter or the newsletter with just story 1 on it ? If Newsletter Gold is set to be viewed by Gold group only does that mean that if I use your default Newsletter widget only Gold group user will be able to see it ? Let’s assume you will send Newsletter A to the members of the Gold group, Newsletter B to the members of the Silver group. gold and silver are access restrictions set on the stories so that only members of groups that have those capabilities can see them on the front end. I hope that helps you further, but please ask if you have any doubts and I’ll be happy to answer. I have no idea if what i received via email is an answer to my question, which I cannot see here now. It appears to be an answer to another post. Confused!! I am at a loss as to how to make this work. I have followed your instructions as closely as I can and, although it says that the campaign has been executed, nobody receives anything. I really don’t know what to do to get a monthly newsletter out. So far, it has been a complete failure. I must be doing something stupid, but have no idea what that is. Could you give me a possible clue as to what might be happening? This sounds very much as if cron isn’t running on your site. Cron must be working so that the scheduled newsletters can be sent out. Can you please use WP Crontrol to check it? The DISABLE_WP_CRON constant is set to true. WP-Cron spawning is disabled. I’m on WP Engine and there is an alternate cron which I’ve asked to be enabled. It runs every minute, so I should (fingers crossed) be good to go. I mention it in case anyone else using WP Engine has the same issue. Thanks for mentioning it Nigel, that’s very useful. We’ll add it to the documentation.